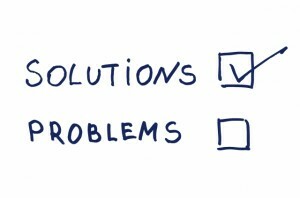 Do you look for solutions to problems or problems to solutions? Previous to this post, I’ve also written about the value of being young and naïve vs. well seasoned and experienced. I have found that it’s not uncommon for experience to sometimes act as a burden when it comes to problem solving. When we think we know it all we start to become those who know less and less. At some point, because of our experiences, we inadvertently become closed off to challenge of new or changing ideas. That’s when we hear from others, or think to ourselves, “I’ve been doing it this way for X number of years – why would I / should I change?” Our well-honed routines provide us with the comfort that we know what we are doing but they put us at risk for becoming less curious about what we could be doing differently. So, I come back to my opening remark; do you look for solutions to your problems, or do you find yourself finding problems in your solutions? This isn’t the type of message where I offer an easy fix-all solution. There isn’t one. It is simply a question that I ask of myself, and I am suggesting that you ask it of yourself. I believe that simply this act of self-reflection will lead you to do a bit of both, which is, in my humble opinion the right way to go. In order to perform at any efficient level you must be looking for solutions to problems but you also must have a sense of what problems might arise. Having an idea that a problem might present itself is much different than assuming that a problem will present itself. The former allows you to anticipate change and challenge; the later leaves you unwilling to change at all. Before I sign-off – another self-reflective question; (and it’s one of my favourites!) In conversation do you listen, or do you wait to talk? ! Previous posts on being open to new ideas.